Monocle was at the Boston Festival of Indie Games (Boston FIG), held at Sat, 14 September 2013 at the MIT campus in Cambridge, MA, USA. It was a fantastic event, and I’d like to thank every one who came down to the Monocle booth at Booth D31! The game was really well received, and the booth was never unoccupied, which was a really pleasant experience. 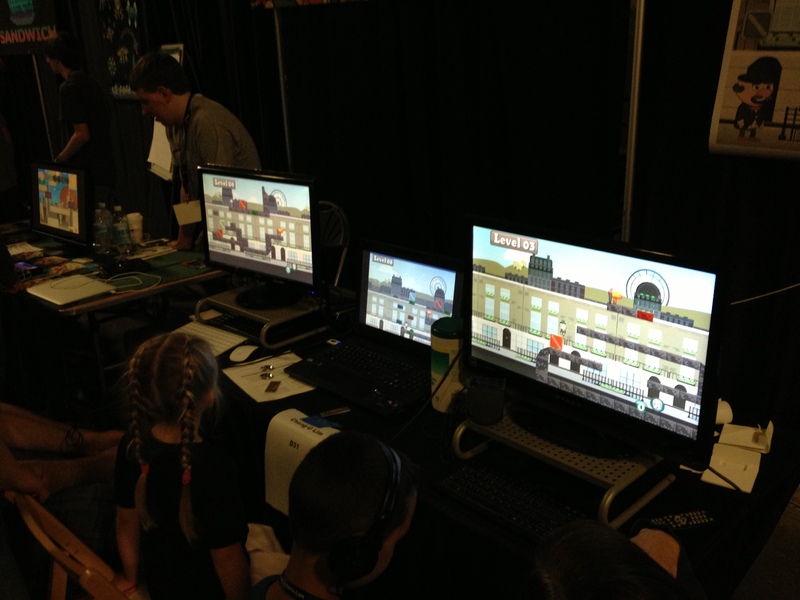 We had people of all ages give the game a try, and it seemed to appeal to a large demographic of people. It was great to hear people who came up to personally talk about how much they enjoyed the game, and also very humbling. I think almost every one who came managed to get a souvenir, though the Monocle stickers ran out quicker than the rest. I’ve been trying to catch up with reviews of the festival on various blogs and websites. So far, I’ve only managed to come across one that covered Monocle. The great thing is it is a really nice review, and I’m extremely grateful for the reviewer taking the time to write up her thoughts on the game. If you have the chance, check out the review “Monocle, Fun with Physics” by Rochelle “NinJaSistah” Hinds based at ElectricSistaHood on EGMNow. Some of the most popular questions that were received at the festival was about whether Monocle was released yet, and how one could get their hands on it. I’m been pondering about these questions for a bit. There are certainly a lot more features that I plan to put into Monocle, and as of right now, even with 8 completed levels, I feel that it’s still a little rough around the ages to see anything beyond an informal alpha testing group. Perhaps a public alpha release is in order! Noble Kale (Twitter: @DarkestKale) was kind enough to give the latest build of Monocle a try, and even made a great video playthrough. Check it out! He raises very good points that we’re looking to address to tighten up the experience. But overall, it was a really, really swell way to wake up to in the morning! The awesome folks over at Toastie Republic did a playthrough of several Feedback Friday games! We’re in at 30min 40seconds! Some of the readers here might be aware already, but I just wanted to mention that Monocle was shortlisted to be demo’d at the Boston Festival of Indie Games on 14, Sep 2013, at MIT, Cambridge, MA in the US. It’s something that, personally, I’m really proud of, and I’m really thankful to all the judges, curators, volunteers, and everyone involved with the festival for organizing this, and for going through the whole curation process for selecting the games for the show. I submitted a version of Monocle that was built in HTML5, and it was originally made for a Student HTML5 competition called “Got Game?” by Clay.io. I made the a prototype in a couple of days, and submitted the game after developing it for a weeks whenever I got spare time (mainly weekends, or late at night.) 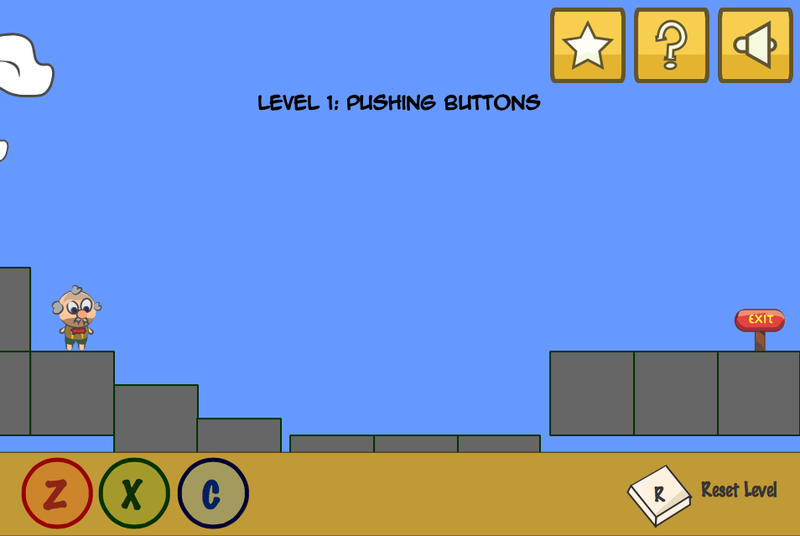 Anyway, the version had about 8 levels, was feature complete, but had several small bugs and a visible lack of polish. For example, the character wasn’t animated. However, I got some really good feedback from the testers of the game, the very nice folk over at Clay.io, and on Reddit. Even though it wasn’t polished up, the general impression I got was that people really liked the idea of the game, and enjoyed it too. 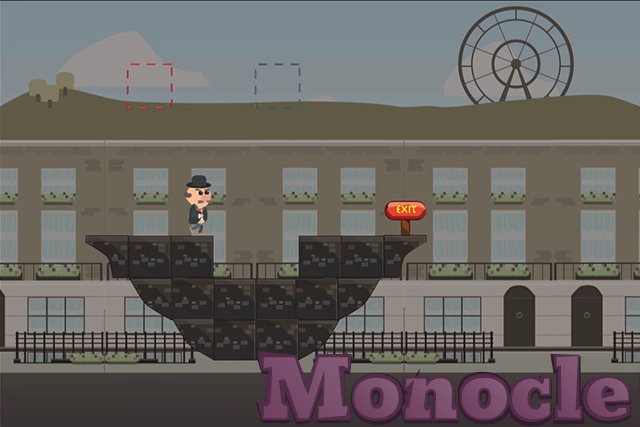 HTML5 Version of Monocle, which was submitted to the Clay.io “Got Game?” student competition, and further refined with added character animations later for the original Boston FIG submission. This gave me an extra push to get something in for Boston FIG. I’d submitted an entry a year before, working with a couple of friends, but a lack of time and planning meant we weren’t able to get something tangible completed, and thus we were rejected. At that point, a few of us made it a point that we would try again next year, and as such, one could say that I’d been waiting to re-submit to Boston FIG for a long time. I’d forgotten to mention that I also demo’d the game at Boston Indies, which is a monthly meet-up of game developers and game enthusiasts in the Boston area. The response was really good, and I was inspired. Anyway, a really good friend of mine helped me get the character animation in, which did wonders in making the game feel better. I was traveling during the period of the submission deadline, and as such, had to make use of late nights and spare periods of time to get some changes done in time for the submission, which was 20th June. Fast-forward to August 2013. I’d been following the developments going on at Boston FIG for quite a while, busy awaiting for the news of the curation results. Part of me felt that I stood an okay chance of getting in … it was feature complete, lacked professional graphics, but I hoped the gameplay and mechanics appealed to whoever was playing it. Another part of me braced myself for a possible second rejection, again. However, the email came, and the first couple of sentences almost made me think that the latter had indeed come true. But then came the sentence, “We are pleased to inform you that your game has been accepted to the Digital Showcase. Congratulations!” Wow, that was an amazing feeling, and I was really excited. I was also very happy to hear that friend of mine, who’d also been rejected the previous year, got in! Things were definitely looking up. Well, that brings us to the point pretty close to now. I’d been busy porting everything from the original HTML5 version to Unity. But, this was more than a port, as I also intended to revamp the graphics entirely, and to work on the feedback received from every single person who had given the game a chance. I felt that at the very least, it deserved that. As such, the whole game looks, and feels, very different now — in a good way, I hope! Based on feedback on both the visuals, and the gameplay, I think it is looking good, and I can’t wait to pack as many things as I can into it in time for Boston FIG. Things haven’t really changed development time-wise; I really only have time on the weekends, and on the occasional spare times I get during the nights of weekdays, since this is really done as a hobby and side-project. But it’s something I enjoy doing, and I’m pretty happy with how development has turned out so far. Monocle Revamped! Featuring revamped graphics, and gameplay. The entire game was pretty much re-written from scratch in Unity. That concludes part 1 of this post. In the next post, I’ll talk a little bit about how the development process went in getting it to a playable state that I felt comfortable to distribute it for testing.